Some time in 2015, Iowa will become the first state to offer an official app from the state's Department of Transportation that can serve as your driver's license and ID. That's pretty incredible. It's also getting us much closer to a more convenient, wallet-free future. 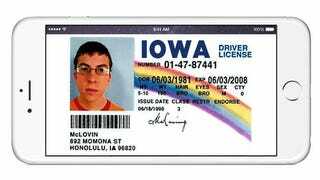 Smartphones won't be replacing driver's licenses in Iowa. (That would require everyone to have a smartphone!) Instead, Iowa DOT director Paul Trombino says that the state will offer "an identity vault app" to supplement citizens' physical driver's license cards. The app will be secured with a PIN for now and will complement the electronic proof of insurance that's already allowed in Iowa and over 30 more states. Trombino told the press, "it is basically your license on your phone,"
Cool, huh? I know what you're thinking, though. What if you lose your phone? Will hackers be able to break in and steal your identity? Ostensibly yes, but the app doesn't sound any less secure than the banking app on your phone. It's also entirely possible that Iowa could offer other ways of securing your electronic driver's license, namely a biometric standard like Apple's TouchID.